Nagi recalls that as a young child, she was at a party at a castle when she fled outside into the courtyard, crying. Young Hisui is in a tree and sees her, then asks why she’s crying. Nagi states that it is because her manga was being made fun of. Some rich boys come out, one demanding Nagi show off her manga to the others. He takes it from her, and when she tries to get it back, they push her away. 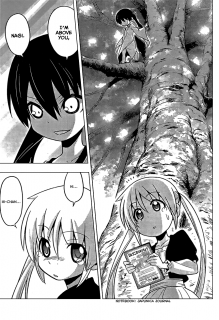 Hisui, who’s come down from the tree, catches Nagi and demands the boys give Nagi’s manga back. They get irritated since they are older than Hisui, but she snatches the manga back and gives it to Nagi, telling her that she should fight rather than crying. One of the big boys punches Hisui in the face. Nagi rushes to her side as the boys gloat. The bloodied Hisui gets up and repeats to Nagi that if one doesn’t like something, they have to fight. With that, she picks up a rock and starts beating the boys bloody, causing Nagi to admire Hisui. In the present, Sakuya is not happy that Nagi has tasked her with dealing with Hisui, someone she has trouble with. Machina asks why this is, so Sakuya says it is because she and Hisui are alike. Their differences are in that Sakuya claims to have common sense, intelligence, and beauty. Since it sounds dangerous, Machina volunteers to help Sakuya, providing she buy him burgers. Har! This chapter reminded me of why I like Machina. If only he were into Cheeseburgers, he’d be awesomeness and a half. I’m glad to see Machina return to the manga’s story. He’d been pretty much forgotten for a long while now. With him attending to Sakuya as she goes to rescue Klaus, it would seem we will get to see him in action. Hisui is also very single minded. We saw that in how she climbed up the tall tree despite the danger, just because she liked the view. This also manifested itself in how she nearly beat to death those older, larger boys. In the present, we know she wants the Sanzenin legacy, so we now have a very clear understanding of how Hisui’s single minded determination will allow her to do anything. As an aside, I wondered if the party depicted in the flashback is the party where Nagi and Isumi became best of friends over her manga. I went back to volume 2 and Nagi is wearing a different dress in that party. I wonder which party came first. 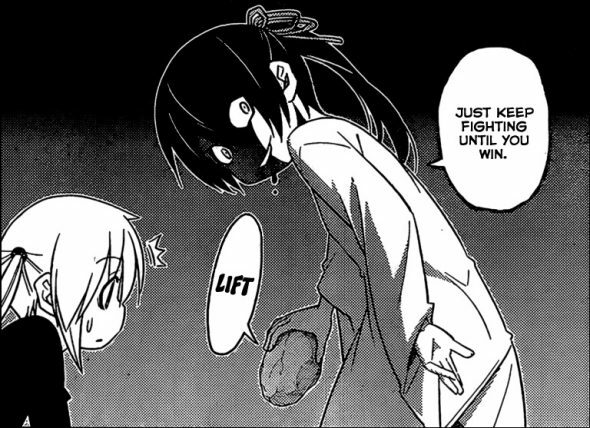 I tend to suspect the Isumi/Sakuya party came first since Nagi was ready to give up manga there after being made fun of, but here, she just cries, but doesn’t give up her manga. What if Mikado is more evil than Hisui, and the Sanzen’in family fortune is cursed or something, and Hisui is protecting Nagi from it. I don’t know that Mikado is “evil” per se. However, I do suspect that his reasoning for trying to open a pathway back to the Royal Garden centers around Yukariko. There have been hints that he’s not really gotten over the death of his daughter. That’s different from trying to prevent Hisui from gaining access. I too am curious about that scar since I don’t think she got it defending Nagi from those older boys. This chapter paints a nice portrait, with only a few brush strokes. At least to me it called to mind the strained metaphor in 325:14, of a genius cook making a delicious soup by adding just the perfect pinch of salt to hot water. It does most of the work for setting the stage to understand Hisui’s character, and I suspect her actions in the future. It does most of the work for setting the stage to understand Hisui’s character, and I suspect her actions in the future. he often needs more pit stops than a nervous toddler chugging Jolt cola. 😆 I think that stems from his notion that HnG is a gag manga first and telling a story second.